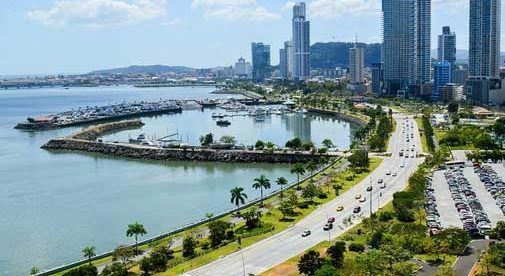 With an impressive skyline that glistens in the midday sun, Panama‘s capital looks modern and sophisticated. It’s not uncommon for me to hear visitors comparing it to other cosmopolitan destinations like London or New York. Of course, with a population of just under 2 million, Panama City is much smaller. But when it comes to events, activities, and amenities, this little, big city more than holds its own. And it has a few “pros” that not even London or New York can compete with. A wide range of art galleries, a new and hugely successful film festival, and more music festivals than I can count are just some of the things I look forward to every year. It’s an active city, and the mild climate has a lot to do with it. Average temperatures are 88 F during the day and 78 F at night. If you love city life—and sunshine, and spending time outdoors—then Panama City may entice you. There are multiple parks and recreation areas, including the lush rainforest trails at the Parque Metropolitano. And the nearest tropical Pacific beach is just an hour away by car. Or you can take the 30-minute express ferry to Taboga Island, just off the Panama Bay. As for the nearest Caribbean beaches, I can drive about two hours or hop on a 20-minute flight. Take that, London and New York. Then there are the other benefits of life in Panama City…known to locals simply as la capital. As the “Hub of the Americas” it’s one of the most connected places on the planet. You can easily travel for business or pleasure, and new direct flights are constantly popping up. I can fly non-stop to Miami of course…it’s just a three-hour hop. But these days I have access to destinations as far afield as Toronto and Amsterdam. And the list of pros just goes on and on. The currency is the U.S. dollar…English is widely spoken…the locals are friendly and welcoming…and it’s easy to set up residence. The cost of living and real estate are not what you’d expect in a city that’s often compared to the likes of Miami. A couple or single can live here on $800 to $1,400 a month if they own their own home. And there are apartments here to suit every budget. If you’ve got $150,000 to spend you may want to check out the El Carmen or Carrasquilla neighborhoods just north of the bay. I live near these myself—they’re central, convenient, and generally much less expensive than trendy bayside areas. One unit of approximately 700 square feet is on offer for $150,000 in Carrasquilla. It features two bedrooms and two bathrooms, as well as a small balcony. You can get larger apartments for this price, but they tend to be older. New property valued between $120,000 and $300,000 comes with property tax exemptions of 10 years. This unit is brand new and so still has a full 10 years remaining on its exemption. If your budget is around $250,000, then you can get closer to the coveted Panama Bay area. Downtown neighborhoods like Marbella and Punta Paitilla offer easy access to the Cinta Costera. A network of roads, walkways, and recreation areas, the Cinta stretches from Paitilla all the way to the romantic colonial district of Casco Viejo. Enjoy morning walks or evening strolls to cute little bars and restaurants (and if you enjoy bicycling, there’s also a designated bike path). A five-year-old furnished apartment in Paitilla is a good example of what the area has to offer. It’s a two-bedroom, two-and-a-half bathroom unit of about 1,200 square feet. Priced at $250,000, it has an ocean view from the balcony. I can’t think of any other cosmopolitan city where you’d get an ocean view in the heart of the downtown banking district at this price…not even a far-off ocean view. And in Paitilla you’re close to hospitals, malls, nightlife, and more…no need for a car. For those who plan to spend a bit more, a budget of $400,000 will get you more than a little luxury. Like an 1,800-square-foot apartment overlooking the verdant Cinta Costera and the Panama Bay. Two bedrooms, two bathrooms, and an open kitchen are just some of the highlights. A massive balcony wraps around the living area, which in turn features floor-to-ceiling windows, for an unobstructed view. The building features include a pool, covered terrace and party area, theater, fitness area, sauna and hot tub, game room, and doorman.